All ERP Vendors struggle to provide accounting and finance departments with timely online management information. Why? Because the technology (relational databases) that is used to build your ERP system, which is very effective in storing vast amounts of transactional data, just wasn’t created to provide summary information like, "Actual Budget Variance" analysis. Typically, the first route to overcome this challenge is to go to paper-based reporting. However, most report writers are difficult to use, require development skills, are slow to run and can’t drill down to the underlying transactional data for further analysis. Then companies turn to Business Intelligence tools to provide summary information. However, here again, there is a major flaw; in some systems the data has to be duplicated to an OLAP database, a different type of database structure that has been designed specifically to analyse summary information. So now you have two databases that have to be linked with complex Extraction, Transformation, and Load (ETL) tools that require high level IT involvement, take months to build and are inflexible if you need more dimensions or changes to reports. Additionally, Business Intelligence systems which were created to handle all types of data for forecasting and historical analysis from companies’ closed periods are simply not designed to accommodate the requirements of a frantic,busy, month end process. 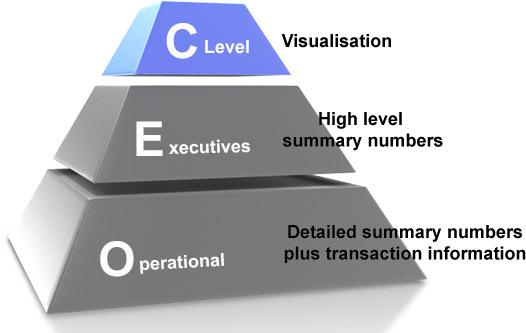 BI companies cater for the C_Level and Executives but not for the operational management. Click on our CEO diagram for an explanation. So, the most common form of management information ends up in spreadsheets (often thousands of them) which makes the monthly management meeting fun as the sales director argues with finance as to who has the up-to-date figures. Spreadsheets have also given birth to what are called "Data Shadow Systems" and more than enough has been written about the inaccuracy, lack of security and dependency upon one or two key macro builders that, if they leave, no one knows how to maintain the key spreadsheets that drive your business. See 88% of Spreadsheets have errors. FastClose is the first company to build an “Accounting Intelligence” system to cater for the hectic month & year end close with the operational user in mind. This is a system that has been specifically designed for your finance department and it will change the way you close your month end forever.There are five key areas that differentiate us from report writers, Business Intelligence tools and spreadsheets which we call the “FAVOR” factors. This is the hectic period 5 days before, and 5 days after ,the month end close. Business Unit Managers and Accountants want up-to-the-second information at a summary and detailed level. Our products have been designed so that end users build their own enquiries, not the IT department. Our product gives the business the capability of looking at any combination of any dimensions in the ERP system at any level. Pivoting, which is difficult to do in Excel becomes a simple drag and drop with FastClose. We turn realational data into powerful OLAP enquiries giving you the best of both worlds. All enquiries are online, run very quickly and can drill down to the lowest level for reconciliation and audit. All our enquiries and consolidations run in real-time, which means any postings made to the GL at month end are instantly reflected in FastClose enquiries. BI systems are aimed a C level people and concentrate on visualisations of the data. Executives want high level variance analysis and graphics. Operational management need very detailed variance analysis and the capability to quickly drill into the transactions. This is where FastClose is aimed at. Check out what Wikipedia says about Accounting Intelligence.